A scene from the Mahabarata, the epic feud between two warring clans. Here, Arjuna gives commands to his charioteer, who unbenknownst to him is Lord Krishna. Arjuna kills Karna, his older brother born to his mother before she was married and was given away - abandoned. 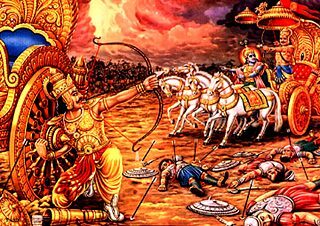 Therefore Arjuna does not realise that Karna is his own brother and egged on by Krishna, kills him in the war - while he is pulling his chariot that was stuck in mud. The rules of warfare dictate that one cannot fight another from the chariot while the opponent is off or is repairing. The father (illgitimate) of Karna was actually the SUN god who gives him indestructible armors made of gold and ear armors too.